The cover for the 5th book in Cassandra Clare's Mortal Instruments series, has been revealed! 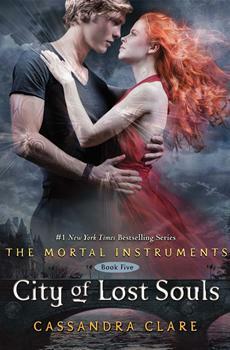 The highly anticipated City of Lost Souls will be released 8th May 2012 and will help readers get over that horrible shock ending we were left with at the end of City of Fallen Angels. This had me on my toes the whole book! Definitely a good book to read! This series is a great one! This book is one of the best yet. Cassandra has really out done herself. I bought this book around noon and didn`t put it down until I was finished.... at four o`clock in the morning. And I have read it atleast another three times since. You would have to be crazy not to be in love with this series and its prequel. I will be waiting in suspense for the next book. Though I had a hard time getting interested for about the first 50 pages, this book turned out to be my favorite in the series so far. If you liked the other Mortal Instrument books, this one will be a real treat!